Eligible candidates are invited to apply for admission in MBBS, BDS, B.Sc Nursing and B.Sc MIT programs for 2018 session. Details of eligibility, seats available, fee structure, admission procedure and other information are mentioned in the prospectus . All required documents and voucher of entrance examination fee mentioned in the prospectus must be uploaded while submitting the form. 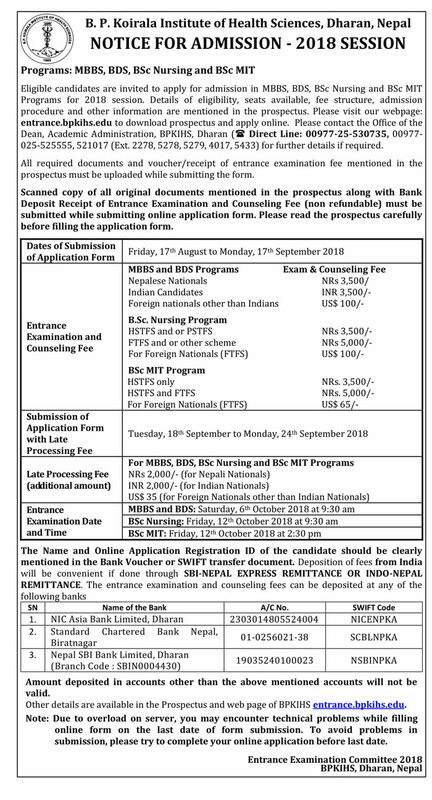 Application form can only be submitted online via https://entrance.bpkihs.edu/.